Purging my closet and home of things that were once coveted and now neglected is akin to a nice, hot shower after ten days without one. I should know. Every time I go through my Goodwill collection process at home, I swear I'll buy less! And save money! And release myself of material things! And save the planet! And be like No Impact Man! And then I laugh, because I know me. I know that I assign sentimental value to everything that comes into my possession which makes shedding myself of things so difficult. Compared to my husband, I have a lot of stuff. With where life has taken him and how many times he has moved, he has become quite skilled minimizing his personal belongings. It's a process, but I'm becoming better at being mindful of what I buy and why... I think. 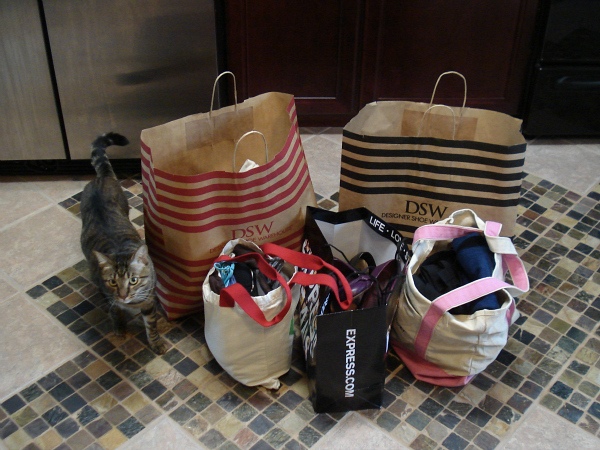 It may not look like much, but life got lighter on Sunday when I donated this stuff to Goodwill. On one hand, this was a lesson in materialism. On the other, I supported my community by helping to create jobs at Goodwill. I'll let you take a wild guess at which explanation helps me sleep at night. To confirm, we did not donate Boone to Goodwill. Are you a regular Goodwill donor? Or thrifter? Thank you for confirming. I don't know what Goodwill does with cats, but I can only imagine it's not cuddling. A. I highly enjoy your Thriftshop reference at the end. B. I am in DESPERATE need of some life purging to goodwill! I have always loved donating with them! My family might keep the local Goodwill in business. My entire family cleans out unwanted stuff from their homes at least twice a year and drops things off at Goodwill. I've also started bringing some stuff to Plato's Closet. They don't pay you a ton, but I feel like it's found money. I've been trying to buy less and thrift more, but sometimes I get overwhelmed by the thrift stores...haha. There is no greater feeling than to purge your house during springtime. I am in the process as well. I can understand your husband's minimalistic ways as we have moved a lot too! Well done on donating to goodwill. It always feels so good to have cleaned the closets, and done something for people in need at the same time. Great blog! i am IMPRESSED! i really need to do this - I'm running out of closet hangers, that should be a sign. Seriously, every time I hear "Thrift Shop" I think of you. I love STUFF and have way too much of it. I seriously need to purge and then learn to buy intentionally but it's such a hard lesson for me. I have a huge pile of bags full of clothes and stuff that needs to be donated. And I need to make another pass through my closet! It's so bad. I don't have much compared to most girls, but it feels like too much to me. I'm all about simplifying lately. And I love donating to Goodwill! Yes! I love donating my stuff. Me and my man purge a few things every month and I try to stick to the "one thing in - one thing out" rule for my closet. I try.... Haha.